Heilongjiang Cuisine, known as Longjiang Cuisine for short, is famous for dishes prepared with mountain vegetables, games, meat, fowls, freshwater fish and shrimps, featuring a pleasant aroma, a delicious taste, and tender meat. Heilongjiang Province boasts rare, delicious, light and tonic green foods with strong flavors of North China. Heilongjiang Cuisine is a new rare flower in the Chinese culinary art garden. 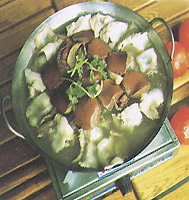 Thanks to the efforts of chefs of Heilongjiang Province, Longjiang Cuisine has formed the following unique characteristics: 1. Paying great attention to selecting ingredients, which are rare, fresh, clear and tonic. 2. Being peculiar about the skill in the use of a kitchen knife and the shapes of dishes. 3. Adopting various kinds of cooking techniques to prepare delicious, refreshing and fragrant dishes. 4. Stressing on the use of nutritious materials and ingredients. 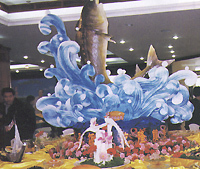 The most representative banquets include the Flying Dragon Banquet, Emperor Kangxi Eastern Inspection Banquet, Emperor Qianlong Huso Sturgeon Banquet, and Bohai Quail Banquet. The famous dishes are Crystal Sugar and Snow Clams, Stewed Spareribs and Potatoes, Imperial White Meat and Snow Sausage, Nurhachi Golden Meat, Green Onions and Liaoning Sea Cucumbers.